The [New Age related] news clipping you sent me claiming that we, humans, are all gods I believe is utterly deceptive and of Satan. Though, what the author states is not really anything new. It is very ancient. The idea started in the Garden of Eden when the Devil tempted Adam and Eve, telling them that they could become as gods, knowing good and evil. Read Genesis chapters 2 & 3. It is a lie of the Devil that says “you are god” (Genesis 3:5) or “god is in you”. That is not so. God is extant to His creation. We are part of His creation. Can the created say to the Creator ‘we are gods’? No, but that is the lie of the Devil. Jesus called the Devil a liar from the beginning of time. God created the Universe, Earth, and every life form, as recorded in the Bible. I believe the Genesis account is literal narrative and should be taken at face value as actual history. But God existed before creation—before time was even created. Subtly the ideas in the article are actually Hinduism dressed up to sound modern and are often repeated by those in the New Age movement. But the bottom line is we are not God or a god, nor is matter god, nor is the Universe God. We are created beings and are subject to His rules. New Agers would have you believe that the Universe and all life just evolved from the properties of matter, that is, from the laws of physics given sufficient time (i.e. billions of years). 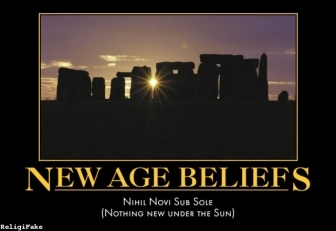 But you cannot prove anything about the past nor measure how old the earth is. I would rather believe in the faithful testament of the only eyewitness who was there in the beginning—the Creator God YHWH (“the self-existent One”). Through faithful men whom He used, God wrote it all down in the Bible and the Devil knows if he can get people to doubt the truthfulness of the Bible, as it was intended to be understood, then he will defeat faith in the one true God. You see it is no longer a perfect world. But that Garden of Eden was a literal place wherein was the tree of Life. If they ate the fruit of it they would live forever. And there was a tree of the knowledge of good and evil, which Adam was commanded not to eat the fruit of. 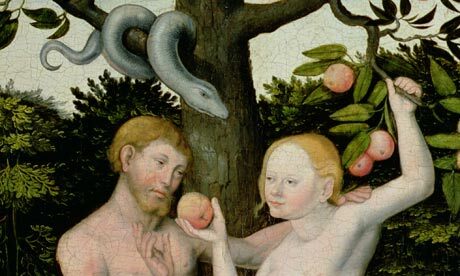 But after they disobeyed God, Adam and Eve were cast out of the Garden of Eden and bad things entered the world because of their sin. So because we are all children (offspring) of Adam his original sin passed onto us all. And note, there is only one race of humans, all descending from one man and one woman. The penalty of sin is death (Romans 6:23). So we all deserve to die both physically and spiritually because who is without sin? (Romans 3:23) But that is not the end of the story. It is only the sons of Adam that can be saved. Jesus is the kinsman-redeemer predicted in the Bible. So that makes nonsense of the idea of sentient aliens from other worlds. When God cursed the world, it was the whole cosmos that was cursed. It is a broken universe in the sense sin affected all of it, the whole creation. Therefore, any putative ‘Klingon’ from out there somewhere could not be saved. Only through him paying a literal price (death) and his subsequent resurrection can we know for sure that we can be saved. Then what can we do to be saved? Nothing, but humble ourselves—yield before Him and acknowledge Him as our Creator. We ourselves are not the way. Jesus is a real person and we are not Jesus,. But if you repent (turn your mind to God), He said He would abide with you. He said He would send His Comforter (the Holy Spirit) to dwell with you. In 1977 in Singapore, one evening I was going to sleep and I heard a very demonic sounding voice. Something was trying to choke me. So I rebuked the demon in Jesus Name and it stopped. But it was very real and not imagined. I wasn’t even asleep but just starting to drop off. That voice was so real and audible I even jumped up and looked around. But there was nothing—it was demonic. It proves one thing—Satan and the demons are real—so God must be also. … fear him which is able to destroy both soul and body in hell (Matthew 10:28). That’s God—but God is Love, true love, sacrificial love and He wants to gather mankind back to Himself. Even still, the story isn’t over. The Bible says that Jesus will return and a thousand years after that, God will destroy the earth’s surface and the heavens, and remake them and then He will plant His heavenly city on the earth and we, the redeemed, will all live in that city with God forever and ever. This is the promise. Well, it says the Curse will be lifted and the tree of Life will be found in the heavenly city and the lion will lie down with the lamb. There will be no more death. It will be Heaven on Earth! This is what we have to look forward to. It is the true happy ending—just hold onto your faith—trust completely in Him. Notice one thing in the account of Genesis chapter 3. God made clothes for Adam and Eve after they sinned to cover their nakedness. To do that God had to kill the first animal. If so, it may have been a lamb, symbolic of the Lamb of God, who would die to cover the sins of the world. To get that covering, like John the Baptist and Jesus said, we must first ‘repent.’ That is from the Greek word μετανοέω, used in the New Testament, which is transliterated as ‘metanoeó’, meaning ‘to change my mind,’ or to do a U-turn. The rest of the story, is that there was a global Flood wherein all died except 8 people on the Ark, and a confusion of languages at the tower of Babel, and mankind spread out onto the continents after the Flood and repopulated the earth. I recommend you read a book called “Stranger on the Road to Emmaus.” It is clear and easy to read and has the clear simple truth of the whole message from God. I know you trust the Lord, but father needs to do so also and he does not have much time left. You should read that book with him. It is so clear and leads from the Creation through the whole story God wrote, lived and transmitted to us. Note: Unfortunately father did not repent and died, in his sins. Please do not let that happen to you or your loved ones. This entry was posted in Belief in God, Creation, New Age religions, Worldview and tagged Adam and Eve, Creator, Garden of Eden, Genesis creation narrative, Hinduism, Holy Spirit, Jesus, Jesus Christ, John Hartnett, kinsman-redeemer, Lord Jesus Christ, New Age, New Testament, original sin, sons of Adam, The Bible, The Creator, The Garden of Eden, trinity, YHWH. Bookmark the permalink. I don’t quite get this following llne: “But even more so, we being the offspring of Adam, He can only redeem those of the human race (sons and daughters of Adam) but not those not of Adam’s line.” What do you mean? Who are the sons and daughters of Adam and who is Adam’s line? I mean only humans who are of the direct lineage of Adam. That means it must rule out any hypothetical evolutionary lineages. ‘Not of Adam’s line’ can refer to either those hypothetical humans who were supposed to have evolved as a group out of Africa, which is total nonsense or any hypothetical aliens from other planets.